Extremely Easy to make Cha Chaan Teng Classic Flavorite: Instant Pot HK Borscht Soup with simple healthy ingredients! 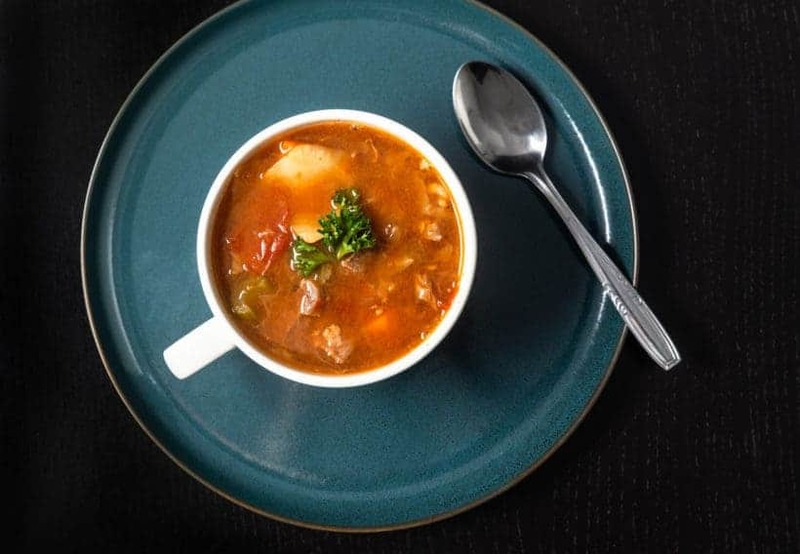 Comforting Instant Pot Vegetable Beef Soup with a balance of savory-sour-sweet flavors, spiced with a hint of paprika. One of Cha Chaan Tengs’ (Hong Kong Style Restaurant) most iconic characteristics is their Hong Kong Style Western Cuisine (Chinese: 港式西餐). The set meals often come with a Main Course + HK Style Drink (i.e. HK Milk Tea) + Soup. Then, you’d get to pick either Chinese Soup (Chinese: 中湯 or 例湯) or Western Soup (Chinese: 西湯). 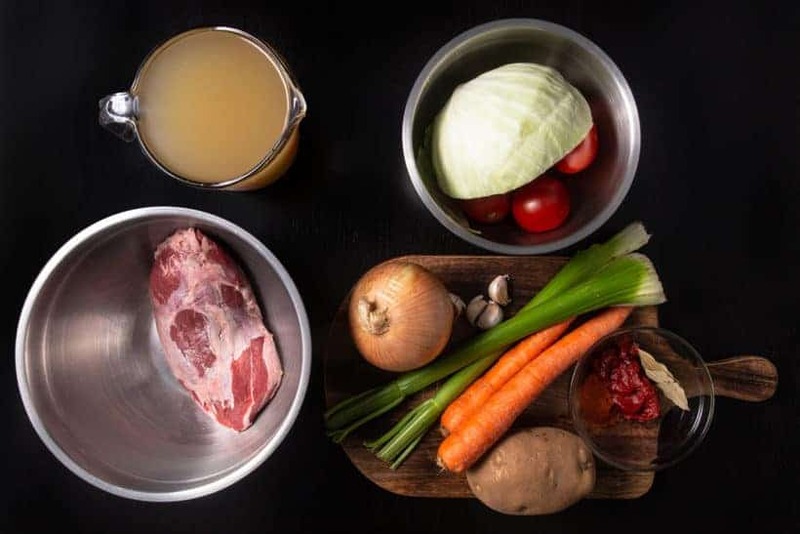 What is HK Borscht Soup? As you can see, HK Borscht Soup is not the blood-red Ukrainian beet-based sour Borscht soup topped with a dollop of sour cream. However, this “Chinese Borscht” was in fact introduced by Russian refugees who migrated to Shanghai. 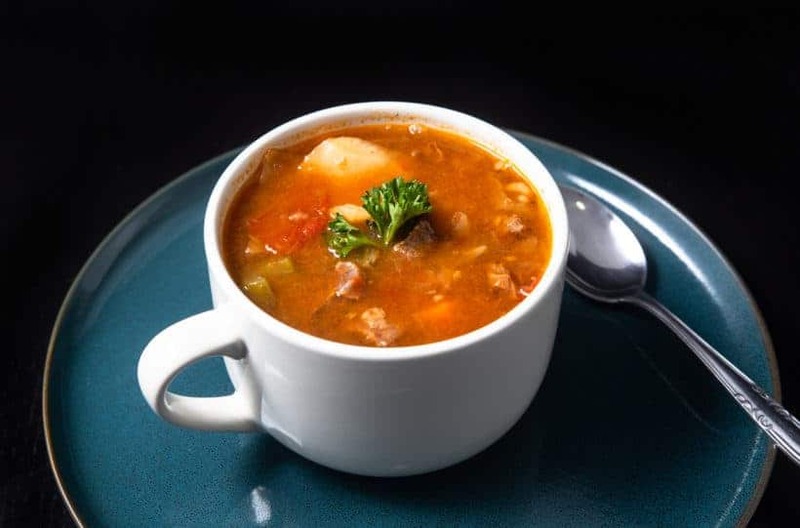 Hence the Chinese name: 羅宋湯, which derived from the pronunciation of “Russian Soup”. Since Shanghai doesn’t have the suitable environment to plant beets, plus the Shanghaiians were not used to the sour flavors, this “Chinese Borscht” doesn’t include beets at all. But rather, Beef, Cabbage & Tomatoes. It was not until the 1940s, with the influx of immigrants from Shanghai to Hong Kong, that this soup was brought alive in Hong Kong. 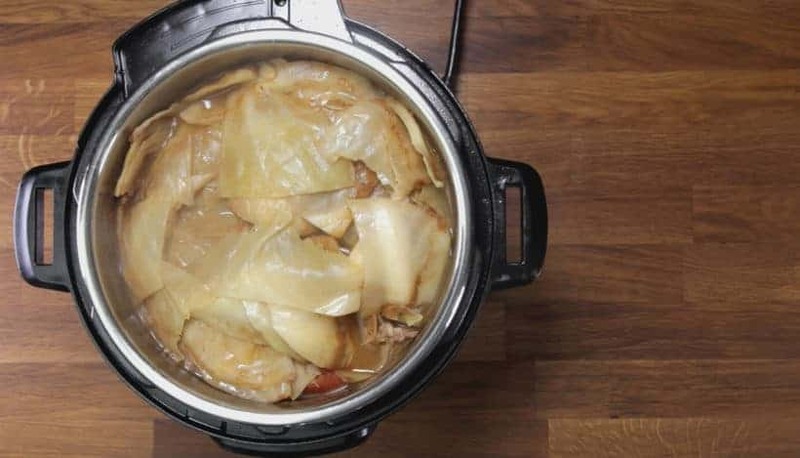 Make Cha Chaan Teng Classic Flavorite Instant Pot HK Borscht Soup in Pressure Cooker. Extremely easy to make with simple healthy ingredients! 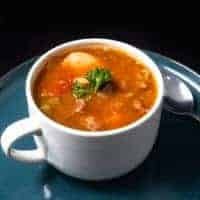 Comforting Instant Pot Vegetable Beef Soup with a balance of savory-sour-sweet flavors, spiced with a hint of paprika. 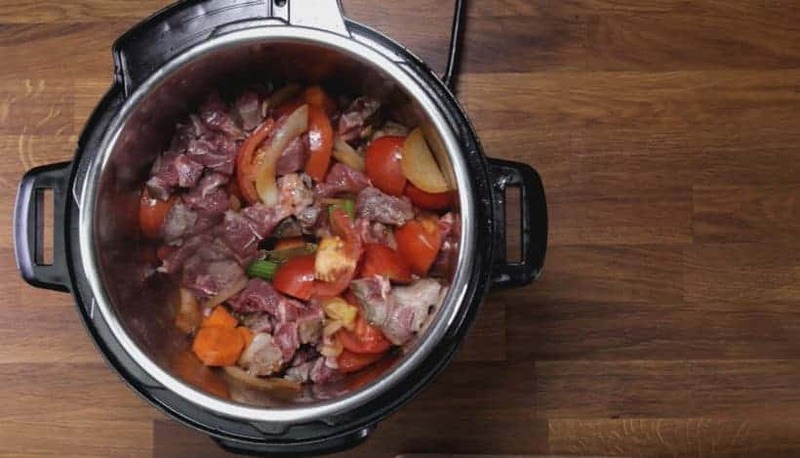 Brown Beef Shank: Heat up Instant Pot using Sauté More function. Pat dry, then generously season one side of the beef shank with salt + black pepper. Drizzle inner pot with 1 tbsp olive oil. Then, brown the seasoned side of beef shank in Instant Pot. Season the other side of beef shank with more salt + black pepper. 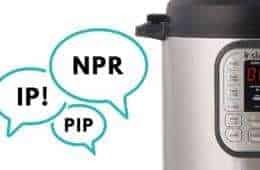 *Pro Tip: Brown the two sides of Beef Shank in Instant Pot for 5 minutes per side. Saute Onions & Vegetables: Rest browned beef shank on a chopping board. Add sliced onions in Instant Pot, then saute until soften (roughly 3 minutes). 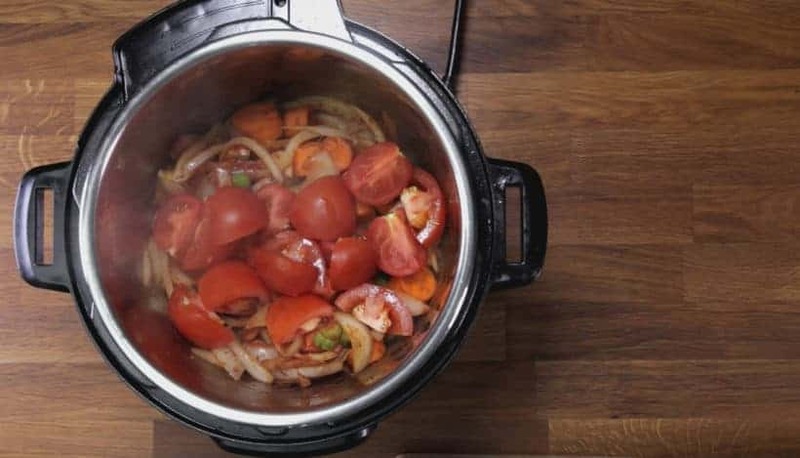 Add crushed garlic, celery chunks, carrot chunks, 2 bay leaves, 1 tsp (4g) paprika, and 3 tbsp (45ml) tomato paste in Instant Pot. Saute for another 2 minutes. Then, add in quartered tomatoes. 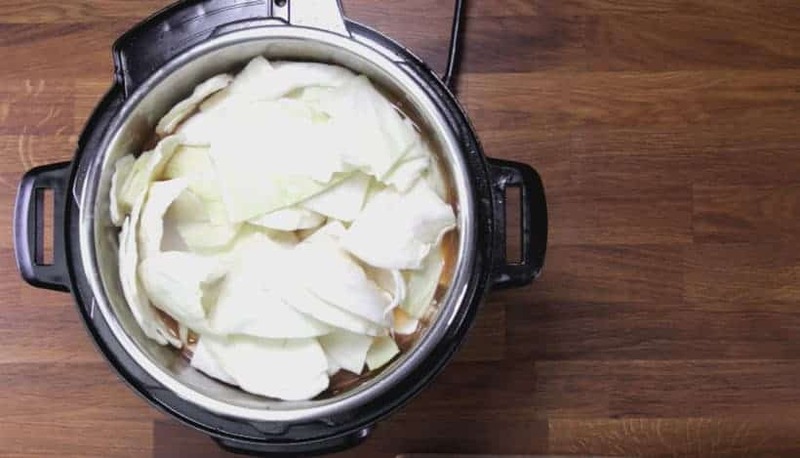 Cut Beef Shank: While the onions are being sauteed, cut beef shank into bite-size pieces. Deglaze: Pour in 1 cup (250ml) unsalted chicken stock or high-quality beef stock, then deglaze by scrubbing all the flavorful brown bits off the bottom of the pot. Give it a quick mix. 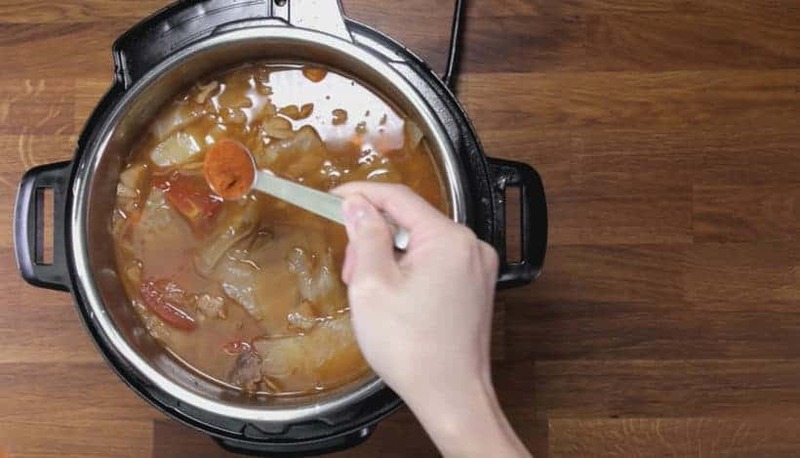 Pressure Cook HK Borscht Soup: Add beef shank pieces back in Instant Pot. Don't forget all the meat juice! Pour in 4 cups (1L) unsalted chicken stock or high-quality beef stock. Layer the potato chunks + cabbage pieces on top. Pressure Cook at High Pressure for 12 minutes + Full Natural Release. 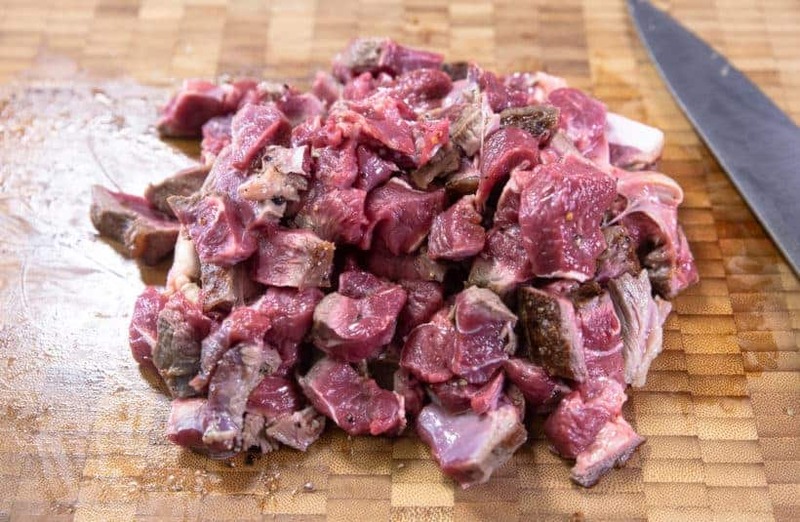 For Dump & Start method, cut beef shank into bite-size pieces. 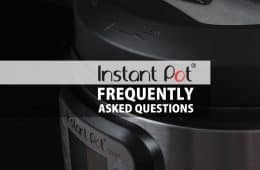 Then, add all the ingredients in Instant Pot, and jump straight to “Step 4: Deglaze”. Pat dry, then generously season one side of the beef shank with salt + black pepper. Drizzle inner pot with 1 tbsp olive oil. Then, brown the seasoned side of the beef shank in Instant Pot. Season the other side of beef shank with more salt + black pepper. 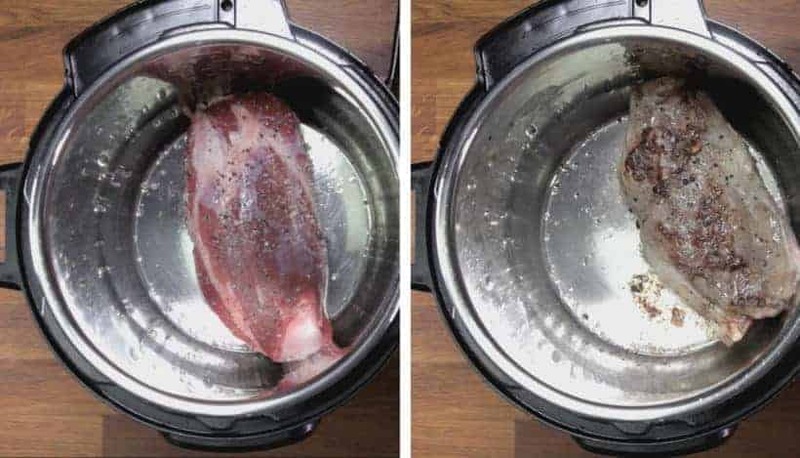 *Pro Tip 1: Brown the two sides of Beef Shank in Instant Pot for 5 minutes per side. Rest browned beef shank on a chopping board. 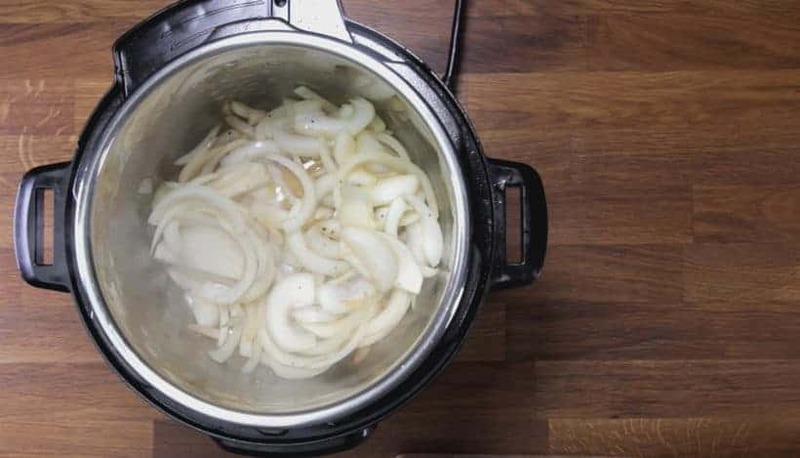 Add sliced onions in Instant Pot, then saute until soften (roughly 3 minutes). Add crushed garlic, celery chunks, carrot chunks, 2 bay leaves, 1 tsp (4g) paprika, and 3 tbsp (45ml) tomato paste in Instant Pot. Saute for another 2 minutes. Then, add in the quartered tomatoes. While the onions are being sauteed, cut beef shank into bite-size pieces. 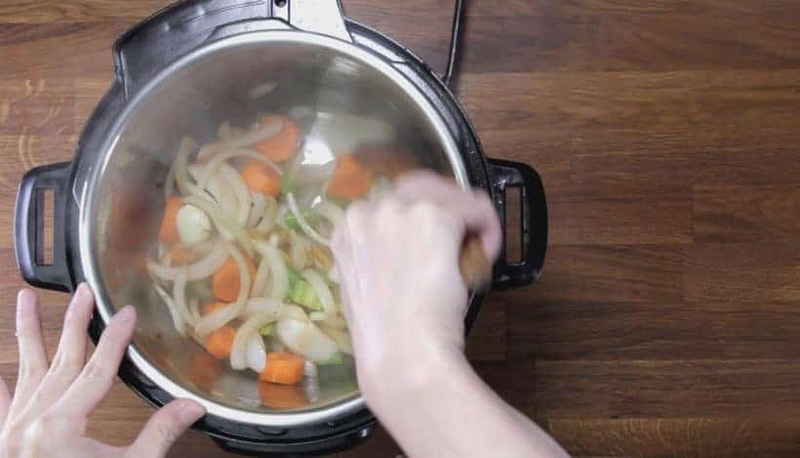 Pour in 1 cup (250ml) unsalted chicken stock or high-quality beef stock, then deglaze by scrubbing all the flavorful brown bits off the bottom of the pot with a wooden spoon. Give it a quick mix. 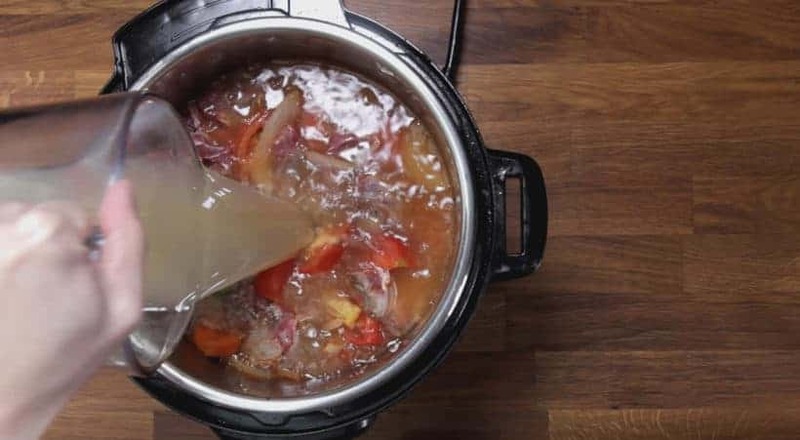 Add the beef shank pieces back in the Instant Pot. Don’t forget all the meat juice! Pour in 4 cups (1L) unsalted chicken stock or high-quality beef stock. Layer the potato chunks + cabbage pieces on top. Close lid, turn the Venting Knob to the Sealing position. *Pro Tip: The natural release should take roughly 30 minutes. 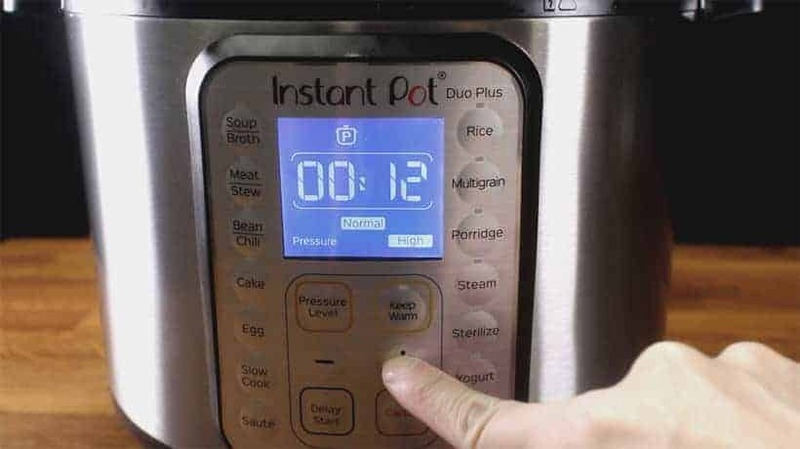 If the pressure doesn’t get fully released after 30 minutes, slowly turn the Venting Knob to the Venting position to release the remaining pressure. 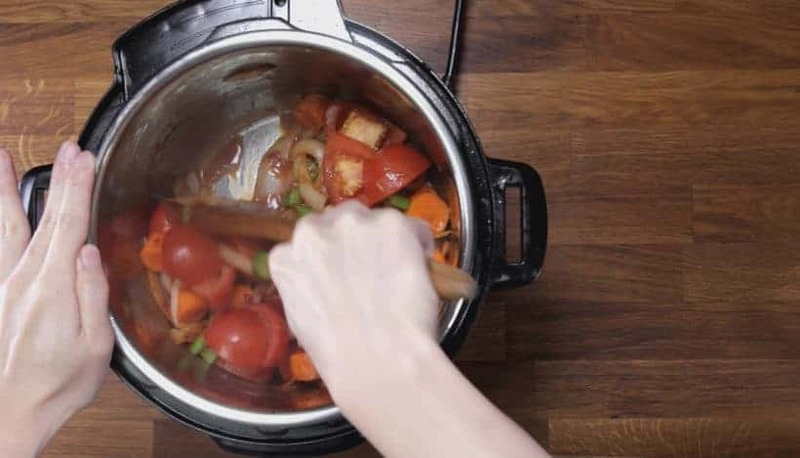 Use the Saute function to bring the soup to a boil. 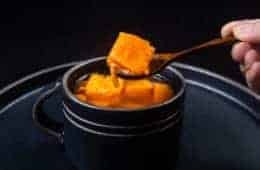 *Tips for Thicker Soup: Give the soup a few quick stirs with a ladle to break up the potatoes, then let it boil for another 5 minutes. You can also add some cornstarch + water mixture in the soup (this is what some Hong Kong restaurants do). Taste and season the soup with more salt + paprika (if desired). For reference, we used a bit more than a tablespoon of salt to season the soup. We also added in a few more teaspoons of paprika. Can I also add pork bone in the soup? Yes, adding pork bones will work great. I made this last night. Thank you so much for sharing your recipe. Husband said it was good, but it seemed like it lacked some flavors. Not sure what that was. Something is missing but I can’t pinpoint what that is. I added more salt and paprika but that didn’t do the trick. I remember the soup being a little bit stronger. What would your suggestions be? Thanks again!! Perhaps the tomato was not sour enough so it was missing some sourness? 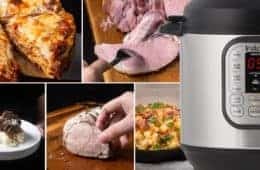 Can i just use the quick release after 12 min pressure cook? Thank you for your question. You will want to wait until it natural release as the soup will continue to cook at this step. Could I use ground beef? I think my son and I would prefer the texture. Do you think it would still turn out well? Thank you for your question. Beef shank adds a lot of flavor to the soup. If you must, please use a good quality beef broth. I had no idea Russians had immigrated to China bringing with them my favorite soup. My family ancestors are Russian Jews and my Mom taught me to make a version of this soup… adding lemon juice and a touch of brown sugar. I use beef short ribs with the bones for flavor. Never tried it in the instant pot but guess what I’m going to make this weekend for Chanukah now? Yep 😀. So fitting as our family is complete with Chinese children too. How’s that for a connection? Looking forward to hear how your family likes this HK version soup! The lemon juice was exactly what I needed! Thanks for the amazing recipe! It was really easy to follow with your short step-by-step instructions and the photos. This was a soup that my mom always made me. My soup turned out to be a little too sour. I think next time I will add a little bit of ketchup as well. The sourness can be from the tomatoes. You can balance it by adding some sugar in the end. Made it for the family and hubby says it’s the best soup he had in a long time. And way better than the restaurants. Very flavorful. Thanks for getting back to me so fast in regards to cooking time when I double the recipe. Came out perfect! Happy to hear how it turned out and your husband also enjoyed the soup! Was wondering if I double or triple the recipe, do I need to increase the cooking Time? The cooking time will stay the same. 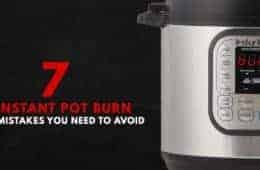 Make sure not to overfill the pressure cooker! This was delicious. I made a few minor changes to the basic recipe. In order to skip the step of cutting the browned meat into small pieces, I used stew meat (chuck) already cut into large pieces – I browned it as directed in the recipe and increased the cooking time to 30 min, due to the size of the pieces, with a 10 min NPR and the meat just fell apart and was delicious yet the vegetables still retained their shape and were very flavorful. Also used 4 cups of chicken stock instead of 5 and used a 14.5 ou can of diced tomatoes instead of fresh. No need to thicken. Thank you for another great recipe. Thanks for another great tried & tested go-to recipe from you. Just to let you know I did not add cornstarch at the final step as I found it not necessary. We truly appreciate your kindness and support! This soup is fabuloso and will be a regular fall/winter meal item for us. The only beef shanks I could find in my market were cross cut ones that were about 3/4 inches thick. It took two of them to make up close to 1-1/2 pounds. I browned them individually on both sides about four minutes on each side. After the shanks had rested, my hubby deboned and cut up the meat for me. I put the bones in the pot when I added the meat, and the marrow from the bones gave the broth a wonderful richness. I didn’t feel the need to thicken up the soup; it was just fine as it was, and we were too hungry (the smell made our tummies growl) to wait for any further cooking. You guys nailed it with this one! I am running out of words 🙂 Thank you once again for being so supportive!! Side story: Amy and I recently had a bowl of beef pho that came with a piece of bone marrow. It was super tasty! You got me on this one. If I have to guess I would say it is the brand of canned tomato or tomato paste they use. Used this recipe tonight as part of thanksgiving dinner, it was great. Everyone enjoyed the soup and it was super easy to make. Agree with Vivian, it was missing something that the Toronto/GTA HK cafes use. Seemed like a vinegar type of flavour to it. Thanks for the recipe! Up next is the curry beef. Can’t wait. thank you so much for your kind review and feedback on the recipe. P.S. 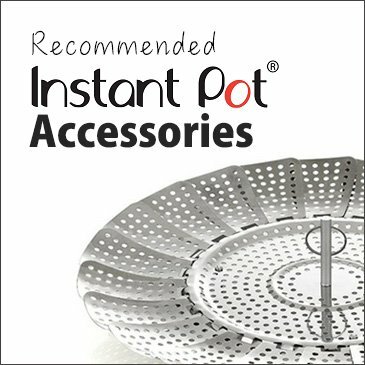 thanks for the many great IPot recepies. P.S.S. Can’t rate recipe yet because hav;t made. But will try it soon, cause it surely looks yummy. 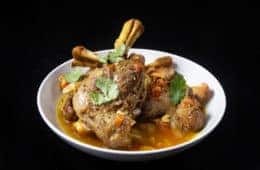 Bone-in beef shanks will work just fine. You can also use chuck roast steak for this recipe. 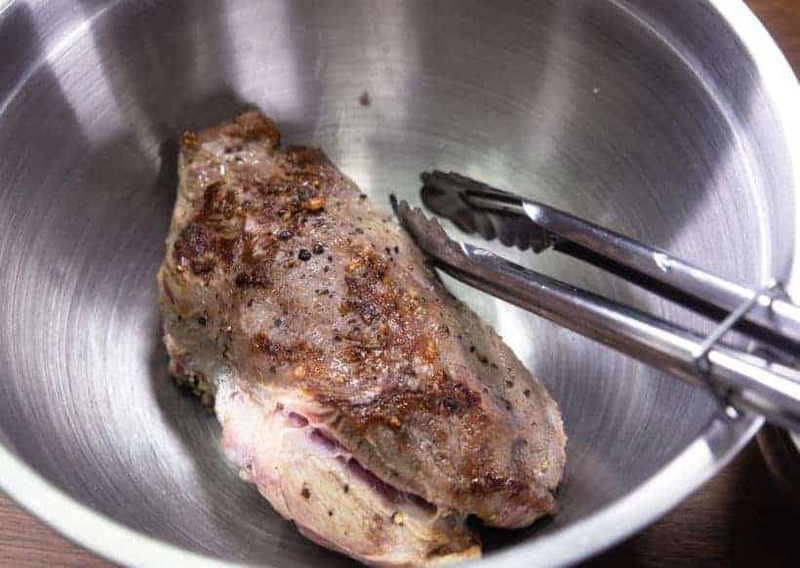 16 – 20 oz will be ideal for this recipe, but 28oz will work fine. 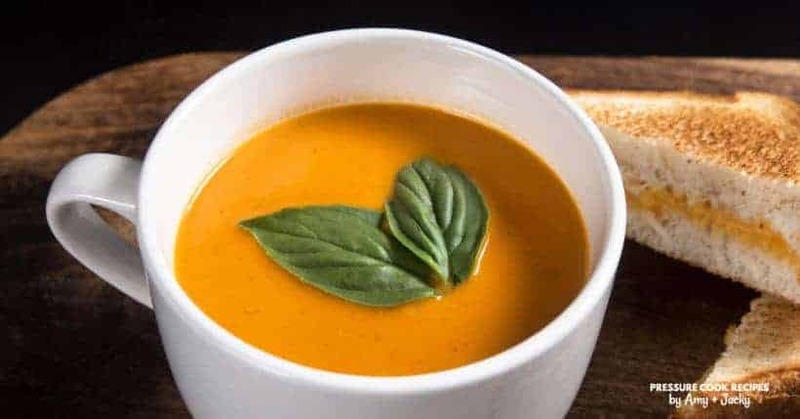 The soup will have a stronger tomato taste. I have everything for this recipe except for beef shank 🙁 If I threw in chicken thighs instead to get some protein in, would the cook times still work? PS. Your site is my go-to for all IP recipes. Thanks for the time and effort you put in!! Bone-in chicken thighs will work, but the flavor of the soup will be different. Amy and Jacky — you made my weekend!! I have so many fond memories of eating this at local cantonese cafes in Southern California and this recipe is perfect! It brings me right back to my childhood. Thanks again for another outstanding, easy to follow recipe. Once again, thank you so much for being so supportive and kind. We truly appreciate it. Thank you SO MUCH for this!!!! I usually don’t go out just to buy the ingredients, but I will do it for this recipe. 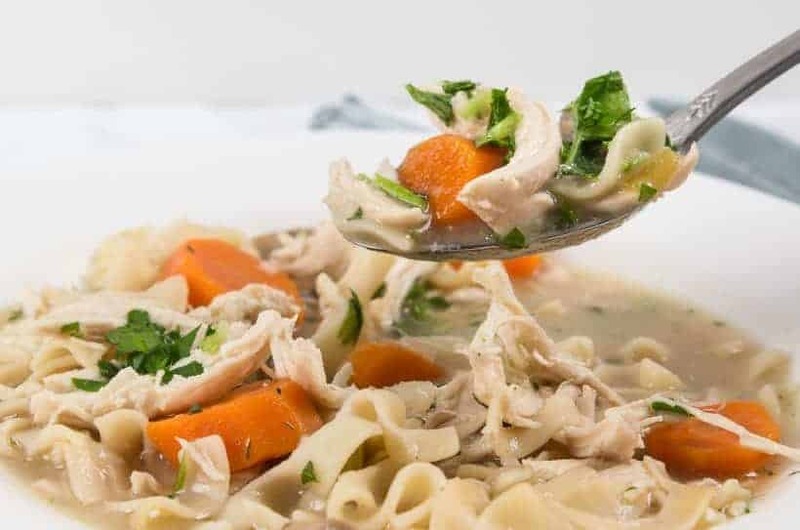 Just one question – you listed either chicken stock or beef stock. Does matter which stock I use? I assume one will give a better taste than the other. The taste will be different. A High quality beef stock will make it richer. 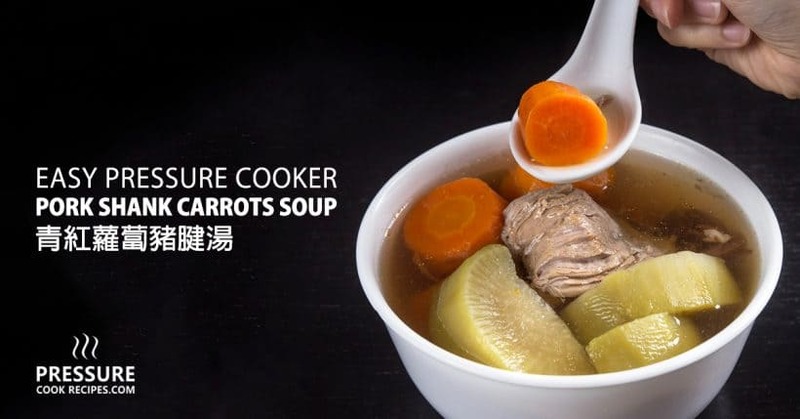 It will taste “cleaner” with chicken stock. 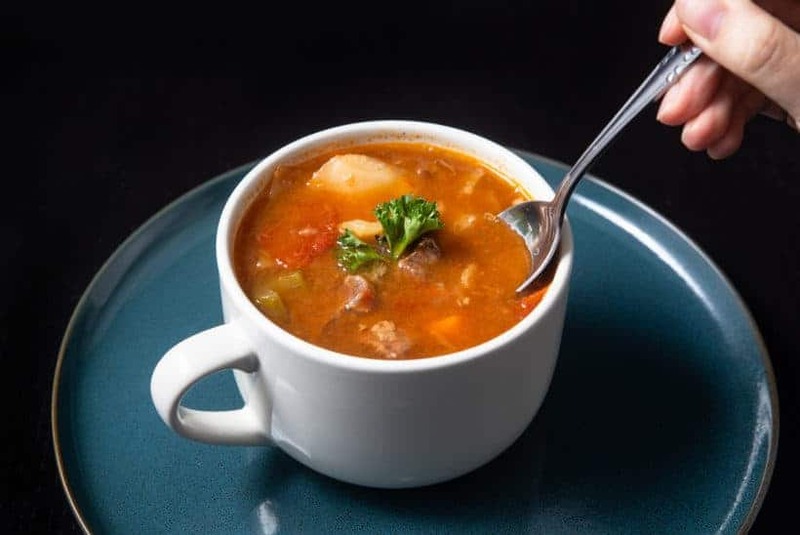 If you are using store-bought version, I would go with chicken stock as high quality store-bought beef stock can be hard to come by. Definitely 5 stars with chicken stock. It’s just how I remember it! I also tried it with beef stock and it’s definitely richer. The chicken stock is perfect! Loved this soup growing up in HK. Mom used red cabbage so every time I see in her grocery bag, I knew she would be making the soup. Haven’t had it for so long and excited to try your recipe. Can’t wait to hear what you think of this recipe.